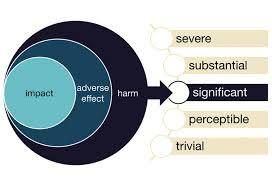 I share your interest in defining the key concept of ‘significant harm’ and have written an article on this subject What is Significant Harm? – a simple guide for social workers My intention was to help student social workers develop a deeper understanding of its meaning in practice and recognise the important role for social workers in preventing significant harm. Children’s social workers need better training in the law. Every day they are confronted with situations where they have to make fine judgements about risk. They need to develop a mindset more like that of a lawyer – so they do not act unlawfully. Thanks Hilary, that is a good and very informative article – I agree. In fact, I will flag it up within the body of the post as it provides a lot more detail for those who need it. What is the legal position re: SC asking about risk of harm? A central complaint (among many) in our Stage 2 Terms of Reference was that the call handler who translated an anonymous request for advice into a referral, that was then made without informing or obtaining consent for information sharing with the parents, and without him asking whether this had been done, and if not why not, also did not ask whether or not the children were at risk of harm. As a result of the referral that was made, our doctor and the health practitioner were contacted for information, without our consent being obtained. The referral was faxed on to the police safeguarding team, with ‘Strategy required’ added by the call centre Social worker. conversation about the nature of possible significant harm to one or both children. implicit assumption that this could be a concern about familial child sexual abuse. different from seeking permission from parents. but I recommend to Adjudication that the complaint point should not be upheld. in the TOR; the I.O. discusses that it would have been good practice to have done so and if this issue had been explored it could have further informed the decision making process regarding the judgement of the advisor to make a referral. Whilst the actual question as phrased in the T.O.R. was not asked this is a technical point as it is not a procedural requirement to do so, and the I.O. Is correct in concluding that it was implicit in the contact details and in the motivation for ….. placing the call. However, the key point in this complaint is the fact that a referral was made in order that an experienced social worker could make that assessment through the formal process of an Initial Assessment and a subsequent SC action also concluded that there should be a strategy with the police. The Adjudication letter, disagreed with the findings of the I.O. only on this point: whether the call handler should have enquired about risk of harm. The issue is whether the question should have been asked. In my opinion it was not an omission to fail to ask it. The nursery was consulting because they were not sure whether their information suggested that the children were at risk of harm. They clearly thought is possible otherwise they would not have phoned. Eliciting further opinion would have been pointless – it is clear they were worried but wondered if their worry was justified. It was for …/SC to decide that question by investigation. The cause for concern was soon found to be groundless. Once SC realised that we had been to the doctor over the same issue (nappy rash) a couple of weeks before, they decided N.F.A. relatively quickly. But as a result of the request for anonymous advice on how to inform the parents being translated into a referral, at the insistence of a call handler, our children have Social Service records for 21 years. And the police hold records for seven. Unfortunately much of the data in the referral is at least inaccurate and misleading, at worst pernicious and ungrounded assumption. Despite almost three years of protest, and many assurances from SC that data must be accurate, nothing has been corrected. We are ordinary parents, as opposed to professional child protection officers, as in the Haringey case, and so are uncertain of the legality of what the I.O., the I.P. and the Adjudicator are saying. We are very confused by the huge differences between our reading and interpretation of guidance, frameworks etc. and SC’s. Frequently they have not upheld a complaint while agreeing completely with every word within the complaint. They refused to include anything to do with ‘Working Together to Safeguard Children’ within our complaint purview, because we did not explicitly mention it in the T.O.R. ; they appear to have breached ‘Getting the Best from Complaints’ in over 30 separate parts; they told us that their call centre has no child protection guidelines to follow, and make no mention of any in their reports. Most recently we have been bamboozled about who made the referral; they seem to claim that the nursery only made a contact; that although they specifically asked if they would have to give names, and were told they didn’t, if they were just wanting advice, and then in the next call were told that they would have to give names, they volunteered them. When the nursery was told this, they said they would have to go and get permission, then call back – and then they did not call back. We have gone to the I.C.O. who found that the data held was inaccurate. 14 demonstrable inaccuracies in 8 short paragraphs. We reckon over 2/3’s of the 300-odd words used are inaccurate and misleading. As a result of the ICO’s involvement, SC again said that they would make some corrections. On condition that we signed an agreement not to pursue the matter any further, and that the corrections were sight unseen by us, and non-negotiable. They also said that the only way that they could correct the information, since the file was closed, was by opening another child protection file on our children to sit alongside the first inaccurate one, the second pointing out the inaccuracies in the first. Inaccuracies that after two years, and a judgment by the ICO, they are still describing as “what you feel to be inaccuracies…”. We did not feel comfortable with any of this. We are anxious for our children not to be under threat from SC, and after progressing our complaint all the way to the LGO, without receiving satisfaction – or getting the record either removed or made accurate, feel we have little choice but to attempt what will be expensive legal action. But we are frightened of losing; after all, our concerns were scorned by the LGO,( who disregarded all the inaccuracies as not being their concern, as there was another public body that dealt with them, and said we were lucky that SC had not initiated a s.47). and, by our stage 3 complaints panel, who despite finding many elements that concerned them in the process, e.g. that the Adjudicator shouldn’t also be the Complaints manager, and shouldn’t be able to alter the I.P. report, etc. – only recommended changes in SC practice, and did nothing to help us. Apologies for the length of this post. Any help/comments appreciated. I don’t want to think you are being ignored, but that is a long post and I don’t want to dive in and try to answer it without giving it proper thought. I will get back to you hopefully before end of weekend. Thanks for considering this – and once again apologies for the very long post. reading it back, I notice one part where I wrote a rather confusing chronology. To be clear: there were three calls: the first, requesting anonymous advice. The second, a call back, half an hour later – at the end of which the nursery said that they would need to get permission to make a referral; and the third, from the call handler to the nursery, asking if they were ok to go ahead. At the end of the 2nd call, he had said he would wait for their call. That was all on a Friday morning. We were informed by the nursery who said that they ‘had been bullied into making a referral’ on the Monday evening at pick-up. As a result of which, I called SC to discover what was going on – and was advised I need to go in for an I.A…. the Chronology created by SC and distributed to Stage 3 panel and the LGO persists in describing the nursery as ‘the caller’ and states that they made the third call to SC. It is clear from the recording that they didn’t. Plenty more misleading inaccuracies sprinkled through the Stage 2 report and the Chronology, which were called ‘accurate and comprehensive’ by the I.P., the Adjudicator and the Ombudsman… but I risk another lengthy post. I believe Social Services were wrong to insist we disclose your children’s names, despite our protestations. They did this on the basis that they had significant concerns. They then did not act upon these- but put the ball in our court in dealing with things in a more serious light! To put it bluntly- they took things forward and then left us to deal with the consequences. Including having the audacity to tell you that we rushed in too soon! They forced us too! Without asking the vital question ‘is the child in immediate danger?’ to which we would have replied ‘No’. Thus discounting the need to immediately disclose names- but be able to take professional advice on how we should communicate with yourselves in this delicate matter. I am fully satisfied that we followed correct procedures and acted correctly at every point. We did as we were told by social services, as professionals in these matters that is our legal duty. I will , in due course, be writing a letter to the relevant authorities outlining my concerns at their handling of this situation. When she wrote, we were already into our Stage 1 complaint – or so we thought … (we were later told by SC that we did not begin our complaint until two and a half months after the incident…) SC met with her without our knowledge and persuaded her to withdraw her complaint, they then told us that she had never made one. 1. A call handler decided that a request from your nursery for advice should be translated into a referral to SC despite not clarifying if this involved an issue of immediate risk to the children. 4. No further action has been taken as there were found to be no concerns but there are now records about you and your children with the LA and the police and these records contain serious inaccuracies which have not been corrected after some years. You have taken this complaint as far as the Local Government Ombudsman and although the substance of what you complain about has been accepted in some parts of the complaints process, your complaint itself has not been unpheld. You think that various guidelines have been ignored, including the ‘Working Together’ guidelines. But you have signed an agreement not to pursue this further? your data cannot be shared without your permission UNLESS a section 47 investigation is underway – there does not seem to be any evidence that this happened. As you have taken it as far as the Ombudsman, it doesn’t seem as if you have any other remedy so you could consider judicial review, which was successful in the Haringey case. their response about the inaccuracies in the information stored about your family is not satisfactory, but I confess I am not sure about the legal remedy for this or the implications of you signing an agreement not to pursue this. This isn’t my field of specialism so I am wary of trying to advise you about this in any more detail. I think you need to seek further advice from someone who specialises in this field of judicial review or malfeasance in public office; a public access barrister could provide an advice about your options for a reasonable fee. it may also be worth contacting @CelticknotTweet on twitter to see if they can advise anyone who could help. Thank you so much for your response. Yes, I read the Haringey case, and agree that there are similarities. The main difference is that in our case SC went on to compound their original misfeasance with serial breaches of ‘Getting the Best from Complaints’, and by denying the existence of protocols that they knew we were asking for, and which we have since obtained via F.O.I. To clarify: we have not signed an agreement not to take the matter further. We refused to sign. Unfortunately, after the response from the LGO – we appealed their decision. We understood, perhaps erroneously, that we were required to do so, before we could progress to Judicial Review. The LGO then waited 91 days ( i.e. : one day over 3 months – the time limit for Judicial review) before responding that they had decided not to accept an appeal, and thus the original decision – now 91days old, would be the one we would have to take to Judicial Review. We spoke to Allan at Celtic Knot at the time, and his advice – as well as, ‘it is never a good idea to take the advice of your opponents…’ was that it was probably too late to undertake a Judicial Review, and that probably the best routes open now were misfeasance/malfeasance and the DPA. He also expressed the view that the LA barristers would probably attempt to bankrupt us… Do you think that it might cost us more than £20,000, to bring the SC to book? Allan’s advice made me think that perhaps the best way to defuse a strategy of bankrupting us would be to become a Litigant-in-person; although that option is daunting. The next possibility might be Direct Access, and I have investigated that – but was told by one barrister that the case was too complex for direct access and would require a team. Because I am relatively I.T. literate, I have prepared interactive navigable pages linking to many of the large quantity of documents, emails etc. – and a detailed chronology that sits alongside the SC one, containing excerpts of the background emails passing between the Adjudicator, the call centre and the I.P. etc. Is a sensible compromise then to get some advice from a public access barrister about prospects of success/possiblity of costs order against you and then conduct the litigation yourself? It might be that you shake them into some better response if you show that you are prepared to take further action. Thank you again. That does sound like a possibility. However, the profession in this county at least seems to be chronically sick. I recently tweeted the Chief Social Worker asking who is accountable for managers and staff who act unlawfully, and she confirmed that a case should be put to HCPC. Sorry, I probably should know but what is hcpc? I hope it is not the norm. I wonder whether some things get ‘stuck’ and people dig themselves into holes and just keep digging when a simple acknowledgement and apology at an earlier stage would have made all the difference. But as a general rule I don’t think any public body should keep inaccurate information or disputed information without making it clear in the records that the credibility of that information is not accepted and the reasons why. I think you are right to be concerned about that. It can certainly muddy the waters for any future involvement/investigations. The Health & Care Professions Council. they are the standards body for Social Work – and run ‘Fitness to Practice’ hearings. be based on respect and honesty. or to understand the decisions made. circumstances, risks, preferred options and resources. accordance with applicable legislation, protocols and guidelines. to record the outcome of such reflection appropriately. methods of reflection and review. I estimate that SC fail on all of the above in their dealings with us. What I don’t know is whether the Health Care Professional Standards body is really going to be fair and treat our complaint any less abusively than SC have. And at this point, especially after our experience with the LGO, our level of trust is extremely low. There is no mention of the mother having been questioned, or asked to provide any explanation, in the call audio – and this has at last, been accepted by SC under pressure from the ICO. to make a referral since it was implicit in the details provided that she had not. We would like to point out a) the nursery weren’t the caller. Our understanding of WTSC framework is that if the decision is taken not to inform the parents, there should be an explicit reason why not. That might be increased risk of significant harm – but if no questions about risk are asked in the first place, how can this judgment properly be made? or promote the child’s welfare. It could be argued that the correct course for the Council to follow was to instigate a section 47 investigation rather than to close the case after an initial and rather more cursory investigation. This would of course have been more stressful and protracted for you, and so I cannot say that you have been caused injustice by the fact that the Council dealt with the referral less formally. Ooops – sorry. I don’t understand why the whole post went into bold. Perhaps I didn’t close a tag…. That’s quite an interesting point – that you were better off because the LA chose NOT to follow its procedures? But also a very dangerous point. The comment CelticKnot made in his blog about the Haringey case was that procedures do matter because one of the obvious consequences of failure to follow them is a lack of trust between the parties – as has plainly happened here. You appear to have certainly identified a failure to adhere to paragraph 10.1. Thanks for that link – I think we should include it in our investigations and referrals post. Paragraph 10.1 of what? Working Together…? Certainly there has been a breakdown of trust. My partner is afraid to take the children to the doctor; she asked me not to accept an offer to do face painting at my older daughter’s school ( I’m/ I was an artist), etc. More significantly for us, though, is the fear that our children will be treated differently because of having a mark ( or two marks, if we had agreed to have the inaccuracies corrected with another child protection referral) against their names throughout school. We think that sort of insidious surveillance is psychologically damaging, and will tend to breed an unhealthy curiousity which may lead to another ‘concern’ being brought to SC. So our children are vulnerable, and we have learned during this process that SC are nothing if not vindictive. E.g. when we approached our councillor about the matter, and she spoke to them, she returned to us saying “Well, they do say there’s no smoke without fire,” and that she was told that by complaining as loudly as we have, “we fit the profile”. Which profile exactly wasn’t made clear. She would do nothing more to help us. I’m sorry. I feel I have made great use of your resource, for which I thank you. I have a couple of other outstanding questions that I was never able to get SC to address. They never wrote up their referral. Despite a ‘compliance unlikely’ ruling from the ICO dating back to Nov. 2011, they have never revealed to us the confidential source logs that they held on our children, which were the source of much of the misinformation. The SC, despite meeting with the nursery long before they ever met with us, always refused to look at them – and because the nursery is independent, SC ruled that they could not be included in the complaint. So no-one from nursery was ever invited to interview. This seems to us to breach Getting the Best 3.6., as well as undermining any fairness. I approached the Chair of the LSCB re: the nursery, who were told by SC that they had behaved ‘entirely appropriately’ – but she never replied, having been told by the Complaints manager, who is also the LSCB coordinator that there was “nothing for you here”. Isn’t it a conflict of interest that the Complaints manager is also LSCB Coordinator…? An assistant Area Manager and a social worker lied to the police, and then to the complaints officers, as a result of which I was almost arrested for ‘threatening to burn down the nursery’. This was not proven until Dec.2013, but has now via an independent police investigation which we initiated. When I presented this material to the SC, the Complaints manager/LSCB coordinator said that it ‘did not affect the outcome of their investigation’ and thus did not matter. But them telling the nursery that I was planning to burn it down caused the nursery owner great distress, and breached all effective contact between us and them, which hurt our children and obstructed resolution. 2. Within the body of the third telephone call is a sentence which the nursery begin with – “Daddy said…” They then go on to list things I had said to them. It is quite clear, but was not heard by the call handler, who then attributed the list of statements as having been things expressed by our 18 month old. This makes them appear rather sinister. Despite the record being ‘checked’ by three ( at least) S/w’s prior to our I.A. no-one noticed that the paragraph of statements attributed to an 18 month old were remarkably sophisticated. Except us. Nor did anyone in either of the Stage 1 investigations, despite our continually telling them. Finally at Stage 2, the Investigating Officer accepted that “it was unlikely that an 18 month old could have said these things.” However, she could not resist maintaining the tendentious line. Neither she nor the I.P. would take on board our transcript of the call, ( I don’t if they even read it…) and obviously they were unable to listen for themselves. Because they cannot listen. “I have not discussed the implications of the 4 year old possibly saying these things)”. This is not accepted as an inaccuracy as ” there is no material difference”. Trying telling that to an engineer. There is a 300% discrepancy in scale, and the comment has moved for singular to plural: in our view what was nappy rash has been transformed into possible stab marks. Another in our view serious, and persistent, inaccuracy: “When Mother was questioned she said she could not comment…” She wasn’t questioned, she wasn’t asked to comment. thanks to the ICO his inaccuracy along with 14 others has now been accepted, but not until our complaints process was considered complete. Doesn’t this kind of pernicious and misleading argument undermine any possibility of a sound adjudication? The line from SC, and the LGO, is that none of the inaccuracies, none of our arguments make any difference, because it would have had to have been referred anyway. We argue that if the nursery had been encouraged to share their concern with us, ( and they were calling to request advice on how to broach matters with the parents…”we won’t have to give names, will we?”, they say at the outset…) we would have told them that we had already taken her to the doctor two weeks before, and were applying cream, and our children wouldn’t have child protection records. However… if it were accurately recorded, if proper procedures were followed, if we been approached about the issues ( some of which, according to the nursery were over a year old…), if we had been allowed the advocacy we kept asking for, if the I.O. and I.P weren’t too arrogant to read our transcript, if the Adjudicator… if… if… then the outcomes would have been very different, and our family would not have been made to endure a thoroughly unnecessary nightmare, that still continues. and which became worse the more the SC complaints process pretended to try and resolve it. It does indeed sound like a catalogue of incompetence and misery and a system that is not responding well or at all to complaints. But I don’t see how that becomes ‘systemic corruption’ as that to me implies a purpose. Sadly, I think it more likely that it is more likely incompetence and (over)reacting to problems, rather than trying to see that the problems don’t arise in the first place. I am afraid I don’t have anything helpful to say about the nursery; it seems very odd to me that they are able to hold information about you that you can’t see or challenge. All I can suggest is that you try to get some initial steer from a lawyer who specialises in this field, to see if it is worth taking it any further. Have you tried contacting your MP? Yes, I’m afraid our MP is a liberal democrat… He tried, but was anodyne. Everyone seems to be in fear of SC. Agree that their ineptness is not often purposeful, more like corruption in the way rust corrupts. Dogmatic fatigue, lack of education and training, lack of resources, all that. However there have been a couple of instances tending towards the malicious. I got into the whole “he threatened to burn down the nursery” thing because I quoted Lacan, and tried to say “Don’t you see how your behaviour is radicalising.. By so radically disempowering us you are creating the very problems you pretend you want to solve…” sort of stuff. The fetishistic surplus, etc. Definitely a mistake on my part to theorise. But I was threatening a thesis, not arson. I have contacted CelticKnot to ask if he can recommend any resources. Thanks so much for your time, help and advice. I am presently preparing stuff with a view to sending it to Doughty Street for an opinion. One thing I have noticed which is common to many professionals is that they do not like to be challenged. In any respect. This is their problem and their weakness, but it can have horrible consequences. Happy to help but conscious that I haven’t been much help here; I will be very interested to follow your case if it does go to court. But SC have proved demonstrably that they cannot be trusted, that they are deceitful and vindictive. [… In Feb. 2013, after we had received a judgement for the ICO, SC finally accepted that the word locked was inaccurate, and that there was no justification for having changed ‘room’ into ‘bedroom’ in the IA. The Council concedes that the audiotape does not support this written statement. The Council concedes that the audiotape does not indicate any lack of concern on behalf of …Father… for his daughter’s welfare. Anyway in Feb .2013 we were optimistic that things might finally be brought to an end, and would not risk returning to distress our family. I still cannot comprehend why when these statements are not supported by the telephone record, it was not a simple matter to correct them. Why did they want so badly to hold onto misleading information – and there is still plenty of misleading stuff held in their reports that they are not prepared to address? …Is it really just so they didn’t have to say they got it wrong? They’ve (albeit begrudgingly, and over a year after the incident) apologised for ‘weaknesses’ ( non-specific). Throughout they kept saying that it is important that the information held is accurate. In his stage 1 response dated 12 October 2011 …X… accepted that these details were recorded inaccurately …. and agreed to arrange for them to be changed. We were told that doing this would re-set the date, thus meaning the records would be retained for even longer. The feedback section of the referral form can be activated and the complainant can be offered the opportunity to provide a short summary correcting the mistakes and inaccuracies in the record. The feedback section of the initial assessment form complainant can be offered the opportunity to provide a short summary correcting the mistakes and inaccuracies in the record. …but that means that they didn’t accept the inaccuracies, they only accept that we claim things are inaccurate – and we know clearly that whatever we say counts for nothing. “Amends” are added to your children’s ….. record via a new child protection referral. Once this new referral is closed, the retention period of 21 years will begin. The letter we had to sign was to give permission for another child protection record to be opened on our children, and to promise no further action. The ICO said they had not agreed any wording, and that it was ‘unreasonable’ to expect us to accept corrections, sight unseen, and without the possibility of negotiation. ..At least we have all this documentation as some sort of proof – but we would like to bring their arrogance to book. Anyway, we believe it is unlawful to place conditions on changing inaccurate data, and to make it impossible for further changes to be requested, if it is found still to be inaccurate after they have placed yet another child protection record on our children’s names. This, I suppose is what must be tested in court. …With reference to your specialism, which paragraph 10.1 did you mean? I looked at both the children’s act, and WTSC – and it wasn’t clear to me. Sounds like a good test case to explore what this duty really means and what LA should reasonably do. We didn’t sign. But we did write and inform them why. And asked them to confirm receipt. They didn’t. Just quick update to all on the basis of my subsequent experiences with the HCPC. Don’t waste your time with them. They pretend to care about standards but will only uphold them in the most egregious cases – if social workers lie, or mislead, or supply false evidence, it appears they won’t do anything. They investigated our case, and on the basis of their investigation, decided not to investigate, because the case had already been investigated by the LA. You what? That complaint investigation was what we were protesting to them about! I am sorry to hear that. I shall look forward to your address at the Multi-Disciplinary Conference, as it certainly does not seem you will be short of material. What a shame they are so useless. Hello I need some urgent advice please regarding the LA intenting to pursue an Interim Care Order, with respect to my two grandchildren, who have been solely in my care since almost a year ago. They have already put a Child protection plan in place but are stating the reason for ‘risk of signifigant harm’ is that the mother (my daughter) can just take them back because she still has PR at the moment. As their mother has already been informed, by the same LA that the children are subject of said Child Protection plan and that any attempts at contact will have to be decided by a court. There is a police investigation underway, covering abuse and neglect of the children whilst in my daughters care, she is aware of this also abd understands she cannot i tain any information or have contact, without prior consent of the relevant authorities. I believe the LA should be funding my appication for an SGO as they have stated that the intention is for the children to remain with me. I believe the Interim care order is uneccessary as there is already enough in place to protect the children, and their interference at this level is very unsertling for me. Criminal investigations do not move at the same pace as child protection generally, if your daughter is on bail there may be bail conditions, but otherwise I am not sure why she is not allowed any contact with her children – this would usually be supervised in a contact centre. Whilst you may feel this is interference, and that is understandable, applications for orders are to ensure the LA can make decisions about the children. From what you have said, there is nothing formal in place in regard to making decisions about arrangements for the children’s future and permanence, you daughter has PR, and can indeed take them with her at any time. I presume the current arrangement is voluntary under S20? It is not legal to withhold the whereabouts of someone’s children in that circumstance. The LA also has absolutely no power at present to dictate terms about contact, they would need an order to do so. If the children have been in your care for a year, you could have made an application for a private law order, that you have not done so means that the children’s future is uncertain and this needs to be more secure. Usually, having assessed you as an appropriate carer, the LA would support an SGO application. I would try not to see this as adversarial but rather the mechanisms that are in place to ensure there is enough scrutiny in place (from a court) in terms of decision making about children and to ensure the decisions made are in their best interests. You would find your own independent legal advice useful. I wonder if the new Data Protection regs that we are all joking about might be a new source of redress??? Data protection law has – in my view – caused more harm than good as people just don’t understand it.